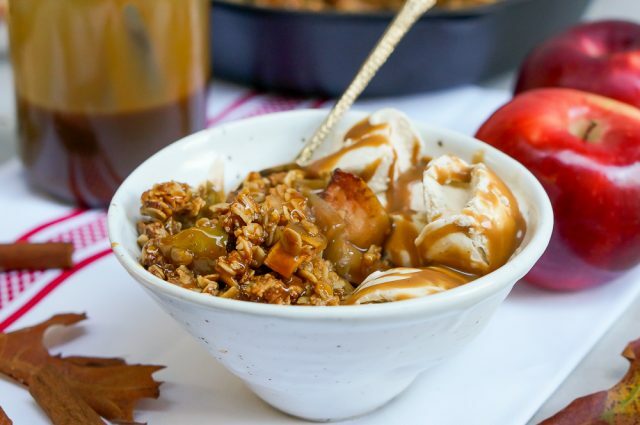 Caramel apples were one of my favorite childhood treats – I remember the struggle of biting through the thick caramel layer that inevitably landed more on my nose and chin than in my mouth, and the immense reward of pulling back with the sticky, deeply sweet caramel and fresh, crisp apple. 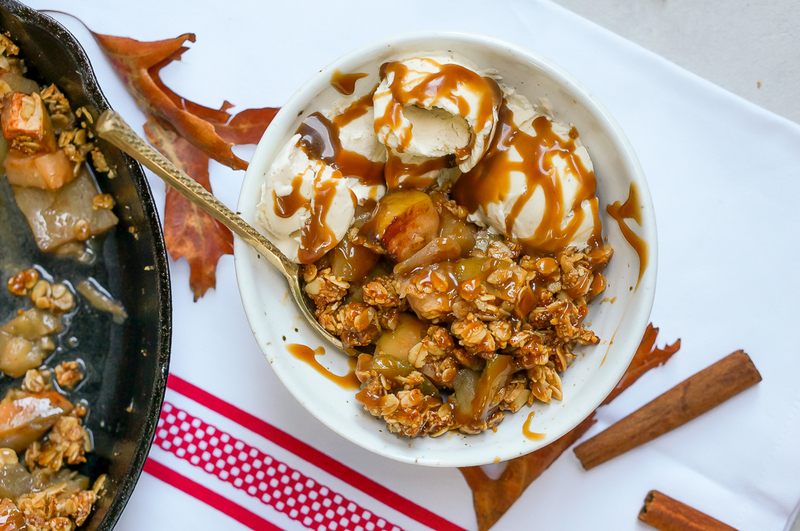 This healthy caramel apple crisp is a grown-up take on that childhood pleasure – except this one is entirely guilt free: dairy free, gluten free, refined sugar free. The secret to this guy is the homemade caramel sauce, which is inspired by the one that lovely Em from the Pig & Quill shared during the #virtualpumpkinparty. 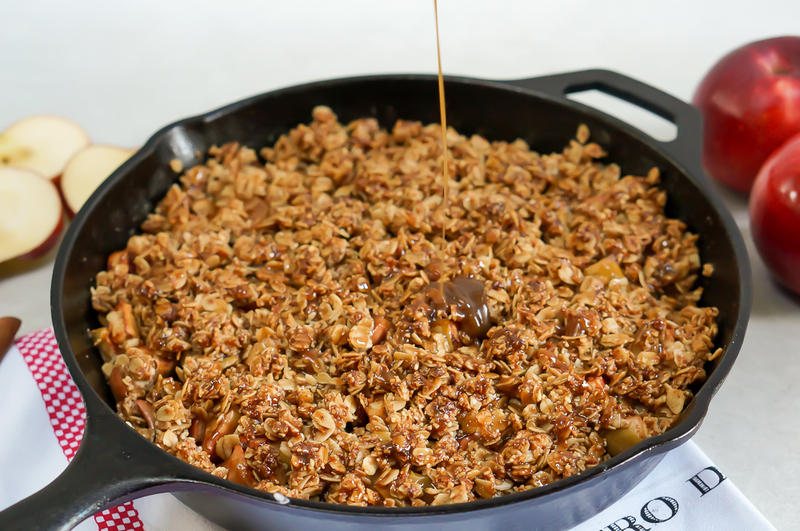 It’s shockingly easy to make, requiring little more than waiting for the coconut milk and coconut sugar mixture to reduce on the stove until it’s ooey, gooey, perfectly caramel-ly. 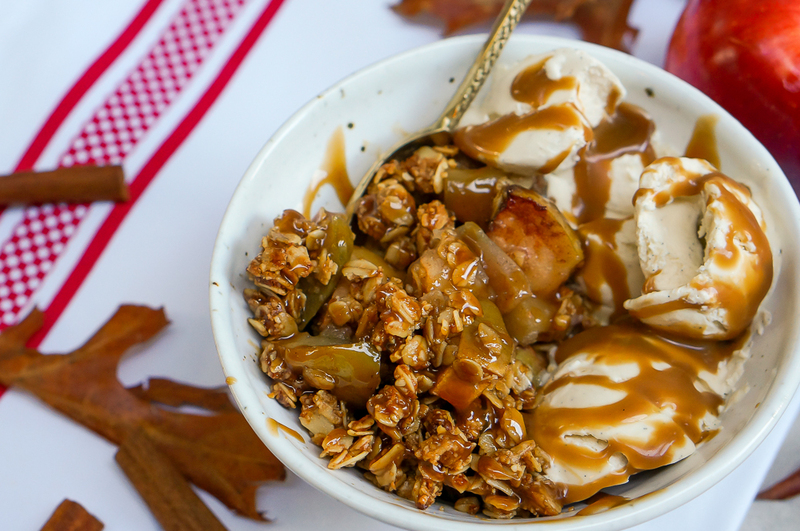 The resulting caramel sauce is just waiting to be drizzled on ice cream, atop cake, or – as I did here – atop an apple crisp. 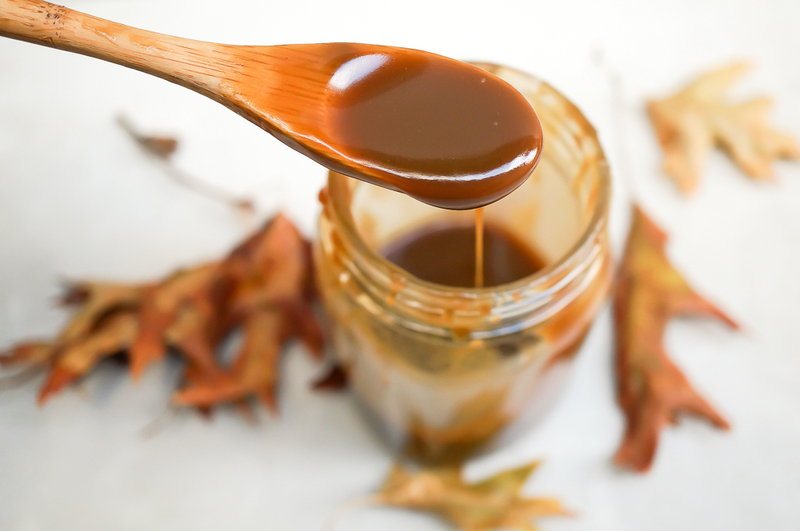 Coconut sugar is one of the secrets to this caramel sauce, replacing typical refined sugar, while coconut milk replaces condensed milk. Coconut milk is a wonderful dairy-free alternative, and loaded with fats that help you actually lose weight. Coconut sugar is a wonderful ingredient as well, and one of my go-tos for refined sugar free healthy desserts. Coconut sugar is a less processed form of sugar made from the dried sap of the flowers of the coconut palm. Unlike typical white sugars, coconut sugar is loaded with vitamins, minerals and phytonutrients, all of which it retains during the very minimal amount of processing it receives. It also contains inulin, a fiber that slows down absorption, which results in a much lower GI than white sugar – about half! – meaning that it won’t spike your blood sugar, instead giving you sustained, moderated energy. You can use any types of apples here – I used a variety that I gathered while apple picking last weekend. 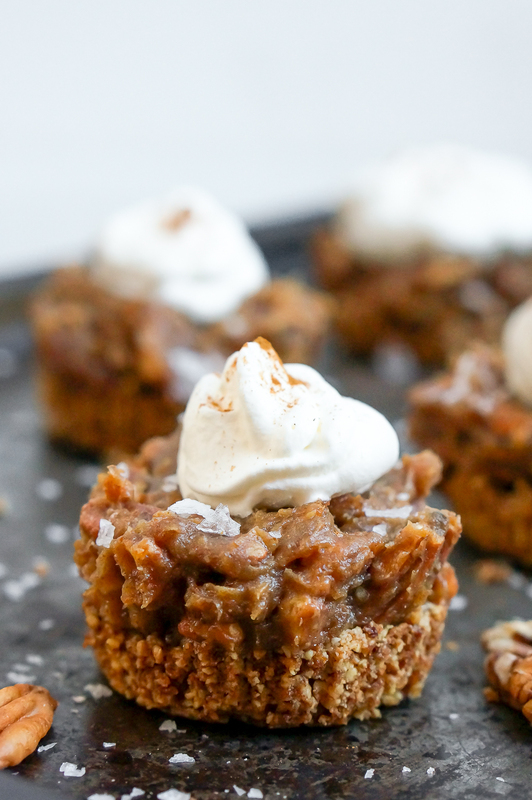 Tossed with cinnamon, they take on the flavors of fall, and have just the right amount of give underneath the oat and almond meal crisp (which, to be honest, I’ve been known to take more than my fair share of). The caramel drizzle on top brings the whole thing to life, elevating this from a delicious dessert to a show stopper worthy of any dinner party. 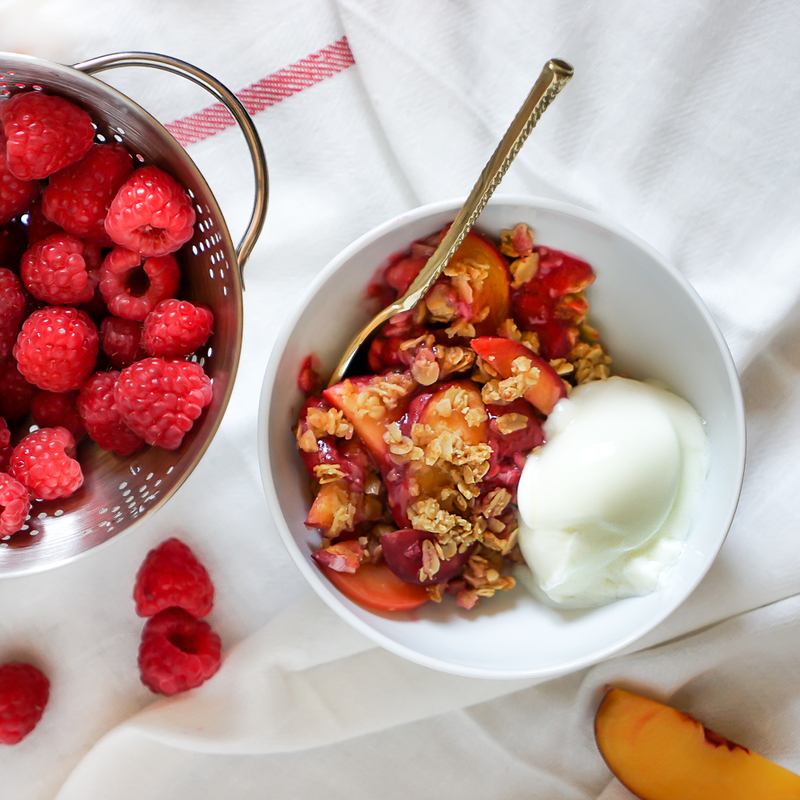 Serve it with vanilla ice cream (I love Coconut Bliss) or just eat it plain – this one is even healthy enough to eat for breakfast. Preheat oven to 350 degrees. 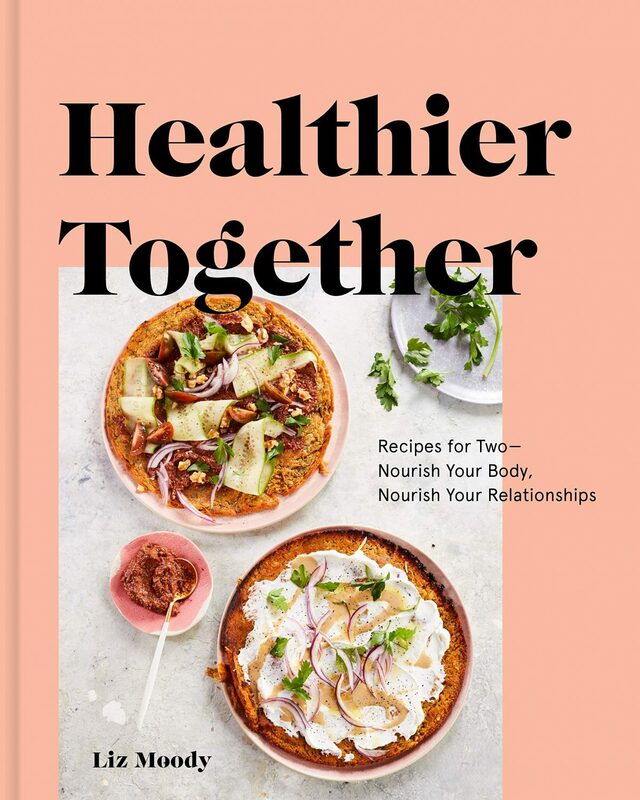 Toss together all FILLING ingredients, then fill a 10″ round baking dish (I used my Lodge Cast Iron) or baking dish of choice. Mix together TOPPING ingredients, then sprinkle evenly over top of filling. Bake for 30 – 45 minutes, or until topping is golden brown. Meanwhile, mix together coconut milk and coconut sugar in a medium saucepan. Bring to boil, then reduce heat to simmer and simmer, stirring occasionally, until mixture is thick, syrupy and deep brown, about 30 minutes. Remove from heat and add the coconut oil and vanilla; stir vigorously to incorporate oil; set aside. Drizzle the caramel atop the crisp and serve. Serves 10 – 12. The crisp can be stored in the fridge for 3 – 4 days, and the caramel can be stored in a tightly sealed container in the fridge for 4 – 5 days. 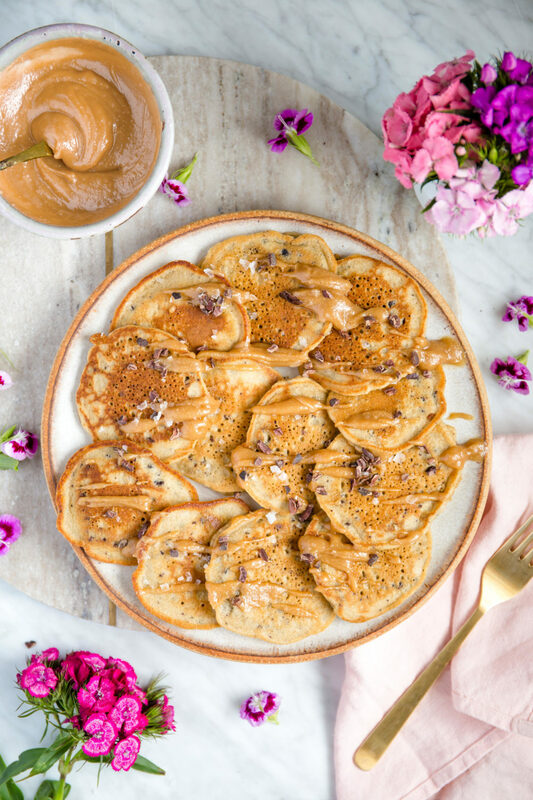 To utilize the full can of coconut milk, this recipe makes 3 – 4 times the amount of caramel sauce you need for the crisp, depending on how much drizzle you’d like. Store it in the fridge and use it on top of ice cream, as a dunking sauce for apples (or just eat it from a spoon, if you’re like me!) throughout the week. Enjoyed this at a dinner party last week. I’m not generally a big sweets fan, but this was AMAZING! Most delicious apple crisp- Love this healthy option! Beautiful addition to any dinner party! Thanks! This sounds amazing! But I’ve searched for coconut sugar in my country and haven’t found it. Could I substitute with stevia? Thanks! This sounds delicious, but I’m confused. In the description it says that you toss the apples with cinnamon, but the recipe doesn’t mention any cinnamon?